Is Nexxxt Level Talent Violating The California Talent Agency Act? Drunk with happiness after landing Jay Ajayi in a free agent bidding war against my nemesis Pete, I tweeted some random things I had heard about Nexxxt level Talent agency.. When my insightful tweets about Nexxxt Level went out, 2 people came to their defense. 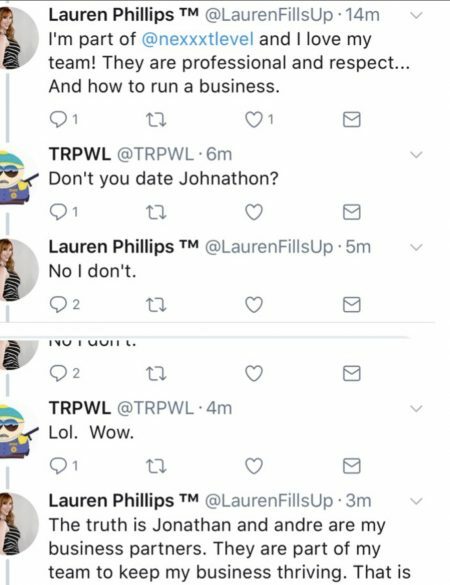 One of those people was non other then Jonathon Morgans roommate/girlfriend, Lauren Phillips. We don’t follow each other, she just popped up on my timeline, made herself look stupid, blocked me, then wiped her account in some Urban X effort to hide the truth..